Big bunch of fresh basil becomes a tiny jar of dried basil. But I still had more basil so I loaded it back up again. 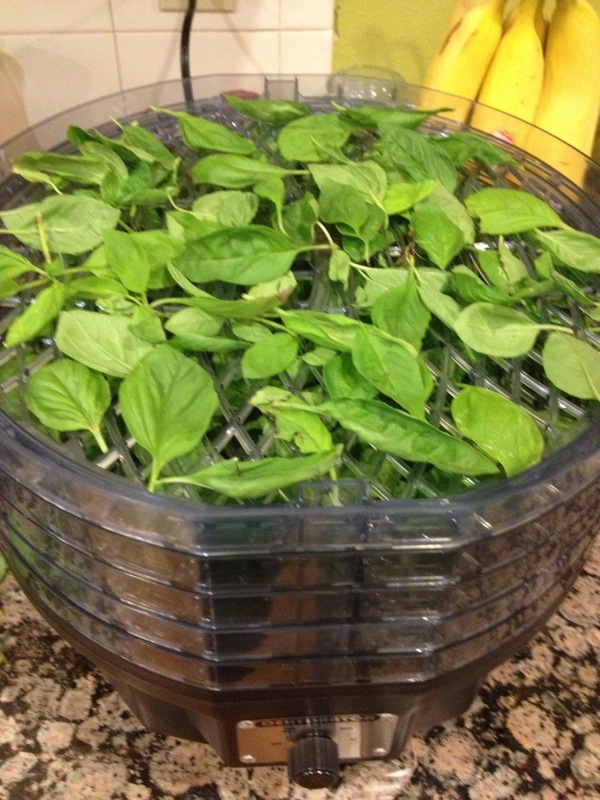 The great basil dehydration experiment has been a great success. And very enlightening. Never again will I wonder why such a small bottle of a spice or herb costs so much. 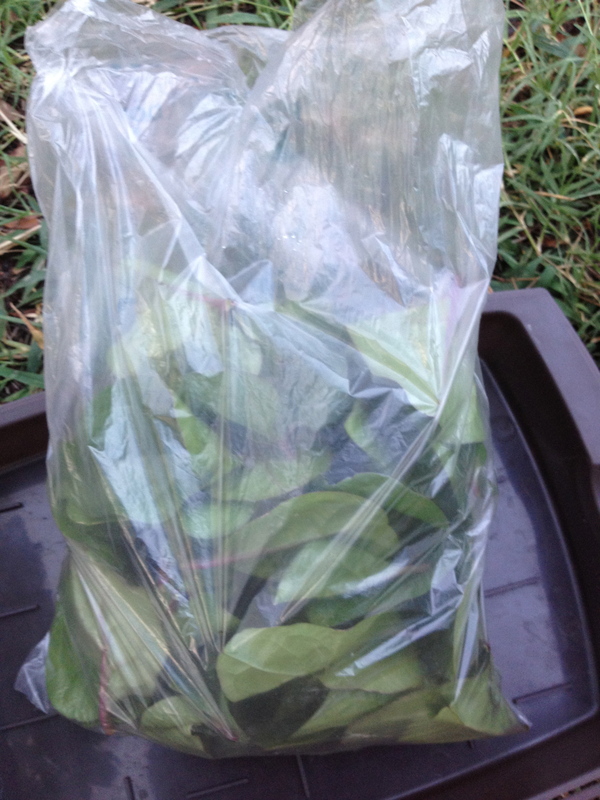 You saw how much basil I picked on Sunday. It had to be taken off the stems, washed, spun dry, then dehydrated for about 2.5 hours. Basically 1/2 of that became what’s in the tiny bottle in the photo above. That bottle isn’t full so I’m continuing to dehydrate to fill that bottle and hopefully at least one other the same size. It caused quite a stir—before I knew it, I was dispensing gardening advice since another coworker has been having bad luck with her basil. 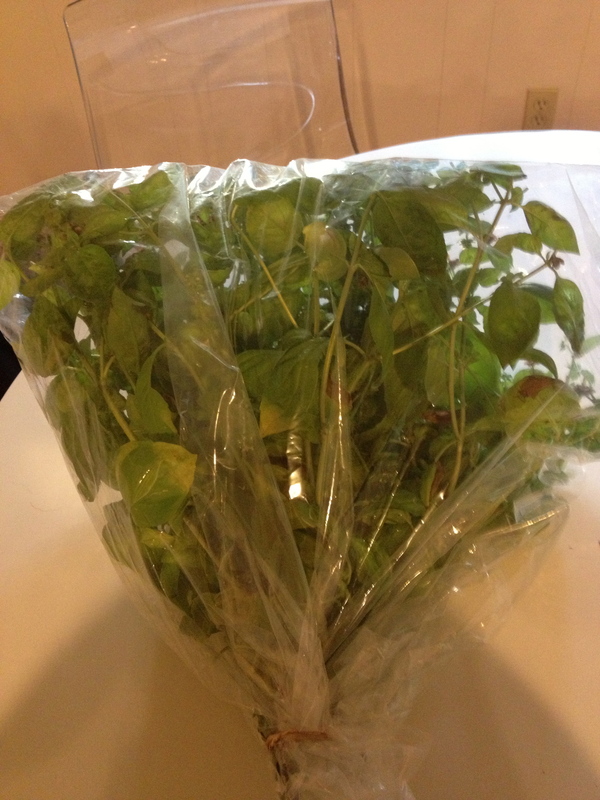 And by the end of the day, the bouquet recipient’s boss was looking for some basil too. 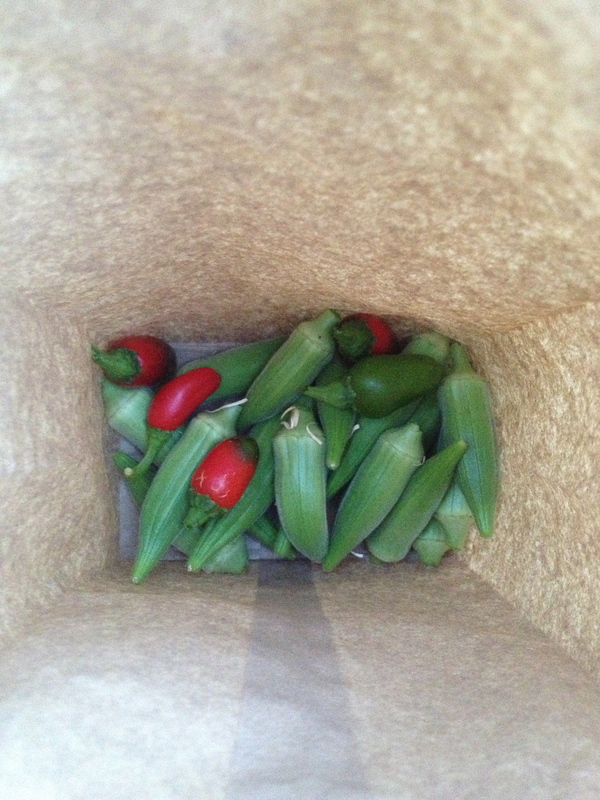 Luckily I have plenty more where that came from so I can bring them each a bag (though not probably as bountiful as the basil bouquet) tomorrow. 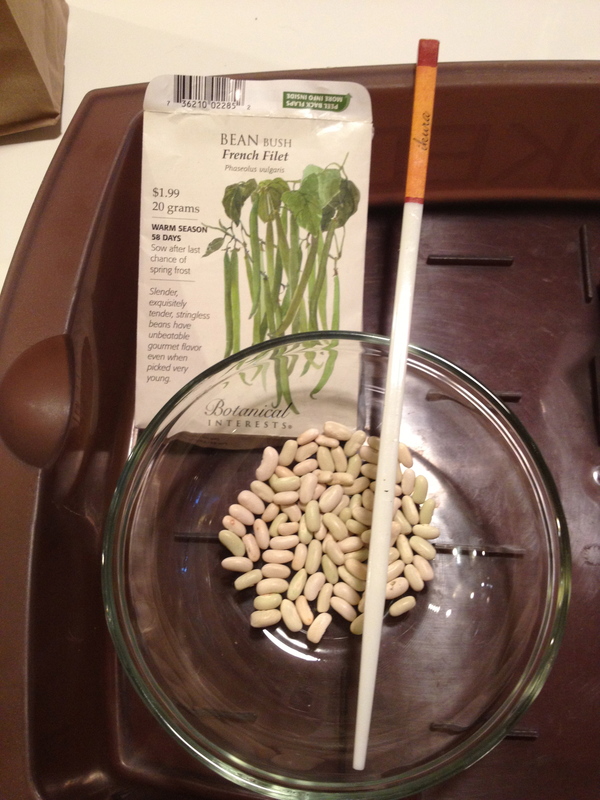 Fall bush beans: chopstick is for making a hole for the two beans that need to get planted in each hole. I also saw a familiar friend. I haven’t named him yet because I wasn’t sure he’d stick around (or not end up in George’s mouth). Got any suggestions for a name? 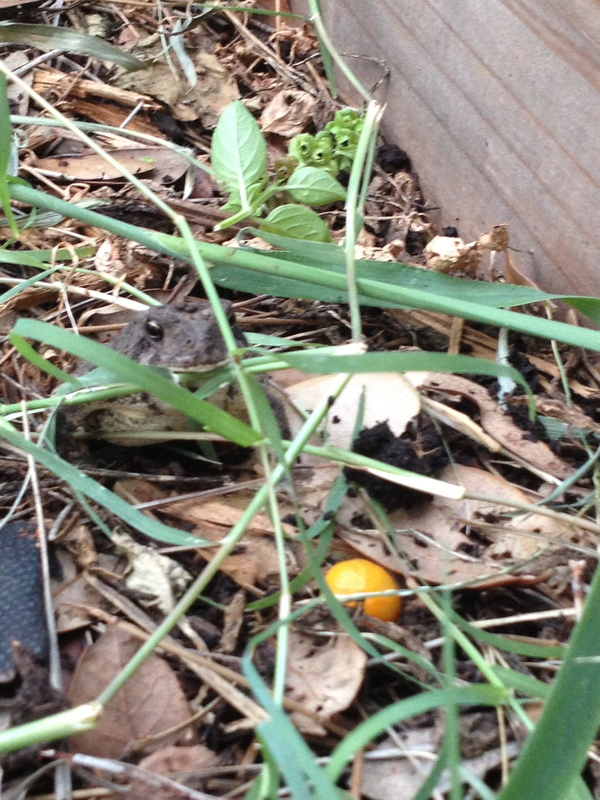 Look carefully for my toad pal. He hangs out near one of the raised beds. And I’m continuing to hit the reset button: Bruce and I went to the gym again tonight for more cardio and abs/planks. Gotta say that I’m feeling it. Well, at least I know that my muscles are remembering what to do. 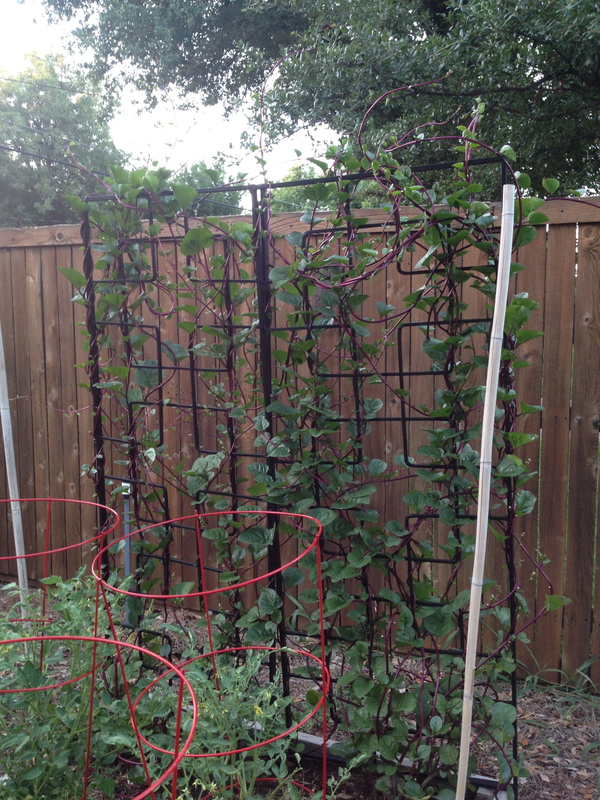 This entry was posted in Sow and tagged basil, basil bouquet, bruce, bush beans, garden, gardening, George, gym, jalapeños, Julie Petroski, Malabar spinach, Mortroski Midcentury Urban Farm, north Texas, okra, sow, toad. Bookmark the permalink. Absolutely love the basil bouquet idea. What a great hostess gift. For that matter you could do a whole mix — basil, rosemary, chives, dill and a little lavendar for colour. Wrapped in cellophane, and tied with twine. There’s a business idea. Wouldn’t it be a lovely bridal bouquet for an outdoor wedding? That is a terrific idea for foodie friends. I have rosemary, chives, basil, oregano, thyme. Dill only grows well here in fall, like cilantro. Italian parsley would be pretty (need to plant some again). 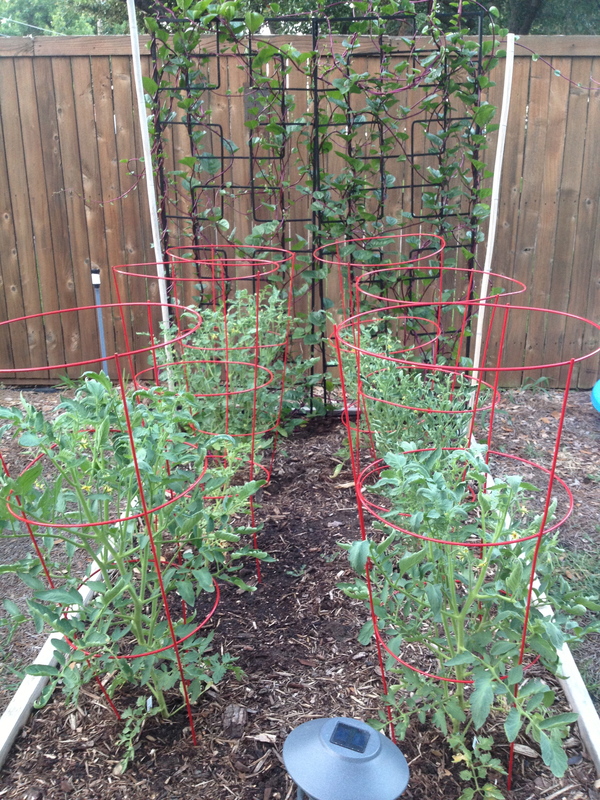 I could even wrap it in brown paper or another repurposed clear bag and tie with garden twine! 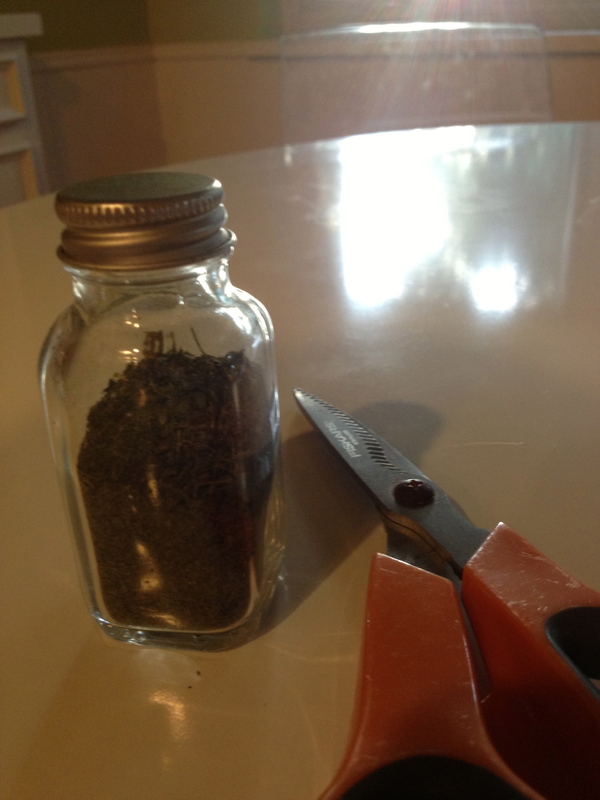 On a smaller scale, it would be a pretty way to sell herbs at a farmers’ market or farm stand. Smaller families and single people could take home a bunch of different herbs that they could easily use up. It would be something that whole foods could sell too. It’s a great way to sell at a farmer’s market or country stand. I’ll bet Whole Foods would sell them and they’d sell like hotcakes. It’s something I’d buy. At home I’d put it in a vase and snip as I needed. italian parsley would look beautiful. Tasty Bouquets.